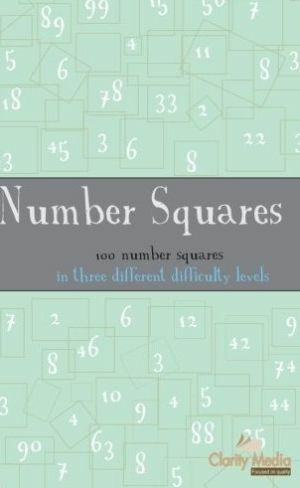 The Book of Number Square puzzles contains 100 brand new puzzles for you to enjoy. This popular puzzle type appears in many magazines and newspapers and is great fun if you fancy a little mental arithmetic. You will be required to perform a range of calculations using the four common arithmetical operators that are addition, multiplication, division and subtraction, to complete the 100 puzzles in this book. 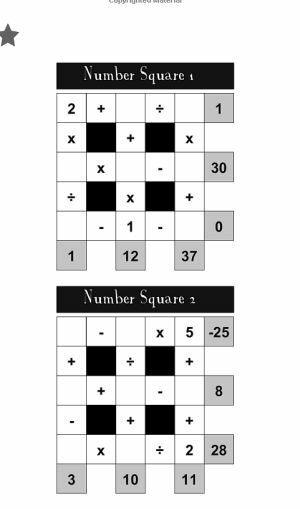 The rules are simple: complete the number squares so that the numbers from 1 - 9 appear once in the grid, completing the sums correctly. It is important to note that the sums are to be calculated from left to right and from top to bottom, as opposed to in strict mathematical order that would require that a multiplication always be performed before a subtraction, for instance. All these puzzles have a single solution. The puzzles get more difficult as you work through them. To help get you started the easier puzzles give you a couple of numbers to start you off and reduce the options, whilst the medium puzzles give you one number. With the hard puzzles you're on your own and have to work out where all of the nine numbers go. There are a range of deductions that can be used to help whittle down the values, although with the harder puzzles particularly you might need to use a bit of if/then logic to work out what could go where and gradually reduce the values. All of the solutions are there at the back of the book, so you'll be a maths whizz once you've completed the puzzles in this book and your mental arithmetic will be pretty impressive! There are various pieces of logic you can use to help you solve these puzzles. The most obvious is to remember that 1-9 are placed just once each. So many solvers like to write out each number from 1 - 9 and then cross them off as they are used. Often you will find that you know that a sum must contain two numbers, but not know the order they are used in. For instance you might know that the two numbers used in a 'times' sum are either 4 x 1 or 1 x 4. But you don't know which way around they go. In situations like this remember to cross off the 1 and 4 because this can help you make progress elsewhere by reducing the options. The simplest way to solve but sometimes the longest is just to look at each sum without using logic one by one and writing down all possible combinations and cross-referencing. However, a little logic works wonders. If you have given numbers, then concentrate on the sums using these first as they will have relatively few options. Also use maths rules to help you: remember that odd + odd = even, that even + even = odd, and that odd + even = odd and that even + odd = odd. Note that if you multiply two odd numbers together, then the result is odd, but that multiplying even numbers gives an even answer, as does multiplying an odd number by an even number. So when the result is odd, you know that the two numbers multiplied together are odd. Given that the odd numbers between 1 and 9 are 1,3,5,7,9 then just knowing this can often be enough to place or at the least rapidly reduce the options for any given sum. Also look for sums where you perform the same operation twice: for instance a x b x c = given total. These often only have one combination of numbers, so pay careful attention for instances where these occur. Each puzzle has one unique solution and you never need to guess - by cross-referencing possible values for sums you can always work out which number must go where, although of course some puzzles are harder than others. Good luck, we hope you enjoy them and find they help develop your mental arithmetic. If you have ideas for puzzles you'd like to see, please just let us know.